In today’s market a quality mat is hard to come by as there are certain aspects of the mat you need in order to get the best results. Below we will look at the features and specs of the product. The mat is made with premium fabric that doesn’t crease. Having a non-crease mat is important as bumps in the mat can slow the ball down and interrupt your practice. The mat surface also has distance markings of three, five and seven feet. The mat is straight and narrow allowing you to work on your alignment. There is an integrated plastic wedge that creates an incline to where the cup is. The steep incline aids in practicing your putting stroke speed. This emulates actual putting conditions so it won’t feel any different when you’re putting on an actual golf course. The SKLZ Accelerator Pro indoor putting mat has an integrated ball return made out of sturdy plastic. The return comes in parts that need to be assembled. The ball return allows you to stay in the remain stationary—you don’t have to walk up and down to get the ball. The mat is 9ft long and 16.25″ in width. The putting green only allows you to putt in a straight line, as it’s designed to work on speed. The product weighs 5.8lb which makes it light enough to carry. Back in the day, you’d never think you’d have a portable putting green to take with you everywhere. Luckily in today’s world, there are so many portable products you can use to perfect a certain skill. Let’s look at perfecting your golf skills in the comfort of your own home with the SKLZ Accelerator Pro indoor putting mat. You get different mats for various types of putting practice. The SKLZ Accelerator aids you in perfecting your putting speed. How Does The SKLZ Train You? Portable putting greens are designed to facilitate training wherever you are, but how can the SKLZ Accelerator assist you with your putting practice? Let’s look at how the mat helps with this and how it’s different from other products. The SKLZ putting green is a long strip with an incline where the cup is situated. The markings on the mat assist you with keeping your club facing square. Keeping your club aligned correctly will help you follow through with your shots more accurately. This SKLZ model has a steep incline to assist you with practicing the speed of your stroke. Hitting the ball at a certain speed will project the ball up the slope and into the cup. The different measurements marked on the map help you putt at different distances. You can putt from three, five and seven feet away from the cup. Practicing this way helps you work on your speed. The further away you are the harder you have to hit the ball. One of the problems amateur golfers face is aligning the club correctly when swinging. The SKLZ Accelerator trains you in squaring the face at all times for a better putt stroke. To improve your backswing you may need consistent practice. Perfecting a backswing is not easy especially for the novice golfer. The SKLZ Accelerator trains you to remove small inaccuracies of your putting game. People love products that make their lives easier. The SKLZ Accelerator gets this right and is bound to make your golfing life a lot more enjoyable. There’s always a time limit when you’re on the golf course. As much as you’d love to spend every waking hour on the course, it’s simply not practical. With the SKLZ Accelerator putting mat you’re able to train for as long as you need to. Cutting back on expenses is something all people have to face, but it shouldn’t interfere with the activities you enjoy, right? Having your own putting green saves on car fuel as well as golf course fees. Practice time now doesn’t have to be dependent on where you are. The SKLZ Accelerator putting mat is portable so you can take it almost anywhere. The mat literally takes less than two minutes to set up and you can do this almost anywhere. There are a few extra parts that you have to assemble but the process requires no tools. The SKLZ Accelerator Pro indoor putting mat is for professional and novice golfers. 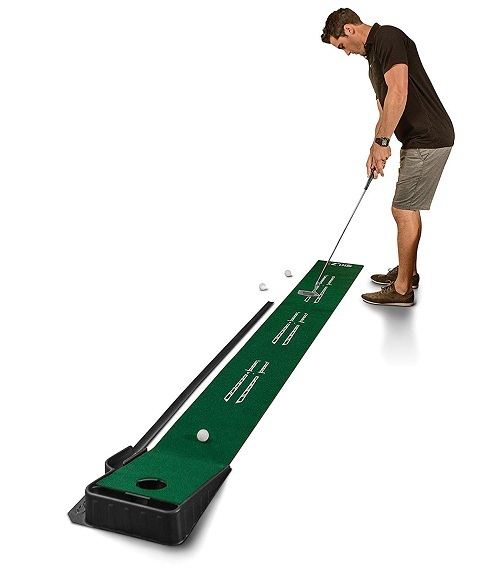 The putting mat can also be used for the average golfing hobbyist. Basically, anyone can use the mat however it’s designed for those who know the fundamentals of golf.